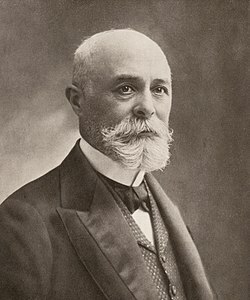 Antoine Henri Becquerel (15 December 1852 – 25 August 1908) was a French physicist. He was awarded the Nobel Prize in Physics in 1903 with Marie Curie and Pierre Curie for his discovery of radioactivity in 1898. This happened when a piece of pitchblende ruined some photographic film and he investigated. Other scientists had seen film similarly ruined but did not discover why. The SI unit becquerel named after him. One becquerel (Bq) is equal to one radioactive decay process per second. He was the third person in his family to occupy the physics chair at the Muséum National d'Histoire Naturelle. This page was last changed on 17 April 2019, at 09:54.